Tale of hope: Congolese-born refugee Cleophas Biringanine and Hope Mugalihya have made a life together after coming to Australia as refugees, and below, Cleophas and Hope on their wedding day at St Brigid’s Church, Red Hill. BRISBANE Knights of the Southern Cross member Stuart Beavis believes Australia’s debate on refugees is on the wrong track with deliberate political misinformation largely to blame. As chairman of KSC Branch No, 1 covering the inner western suburbs, he’s decided to do something about it. He’s organised Congolese-born refugee Cleophas Biringanine to tell his story at the KSC’s annual public meeting at St Michael’s Church Hall, Dorrington on Thursday, September 5. “I really want to get people out of their homes, away from the politicians’ biased opinions,” Mr Beavis said. Those turning up to Cleophas’ talk can expect an illuminating and challenging experience. They will be inspired by a story of great Christian kindness exhibited by Brisbane Catholics, both individually and as the entire Jubilee parish. They will hear of a love story which began in a Malawi refugee camp and finished with a marriage in inner city Brisbane. They will also hear of Cleophas’ determination to make a new life in Australia – of him travelling five days a week to Caboolture by train then cycling to work at a factory as well as working as a cleaner three nights a week. Unimaginable horrors threw Cleophas Biringanine and Hope Mugalihya together in a Malawi refugee camp in 2007. Both had seen family members slaughtered during a civil war in their home country in the 1990s. 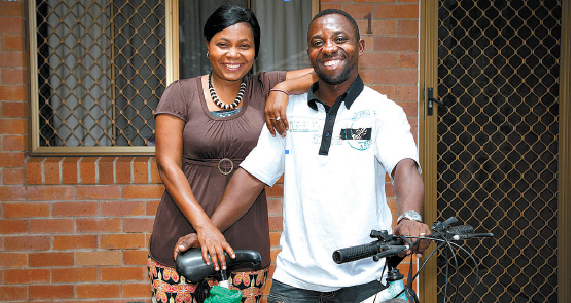 In the refugee camp, the Congolese couple were betrothed only to be separated when Hope was allowed to settle in Australia under Department of Immigration humanitarian protection visa. In a story in The Catholic Leader in March 2012, Hope said on reaching Australia she followed the advice given by refugee advocate Jesuit Father David Holdcroft. “Father said to go to my local Catholic church when I got to Australia and I would be taken care of,” she said. The church was St Brigid’s, Red Hill, part of Jubilee parish. With the support of a Brisbane couple from the parish, Hope applied under the Government’s reunification program for Cleophas to be issued with a visa and allowed to join her in Australia. The couple’s remarkable journey came full circle on September 3, 2011, when, surrounded by parishioners and friends who had helped them on their way, Cleophas and Hope were married at St Brigid’s Church. Since then the couple have started a family and Hope has completed a certificate course in childcare. Mr Beavis said Cleophas’ talk was the latest in a series of annual events run every September by KSC Branch No 1. “For at least the last 12 years we’ve had the September meeting as an open one,” he said. “We’ve had members of the public speak on issues of interest to the Church and the KSC. “That’s been everything from financial matters to stem cell research and the situation in East Timor. “Last year we had Pregnancy Crisis Incorporated speak on support offered by that organisation for mothers-to-be under pressure to abort their babies. “Regarding the issue of refugees, I believe there’s a lot of ignorance in the community. “Politicians are firing the issue up for their own advantage, talking about stopping the boat people and so on. “Refugees such as Hope and Cleophas have come in through legitimate channels but they’re often lumped in with others. “And anyway those people coming in by boat are often doing so because Government processing of refugees is not effective. “With things this way there’s not much hope from either side of Government…so we’ve got to get an awareness of the full story on refugees to ordinary people somehow. The talk will be held at St Michael’s Church Hall, 250 Banks Street Dorrington at 7.30pm on September 5. To attend contact Stuart Beavis on 0411 147 076 or email bsb_himself@optusnet.com.au.